The two leading Israeli financial magazines: The Marker & Calcalist interviewed Gil Horsky, innovation & marketing executive from Mondelēz International, about the topic of his keynote lecture in the “Rethinking Food” conference of the Israel Export Institute on March 26th in Tel-Aviv. The conference focused on the future of food innovation and the role that Israeli food manufacturers and ventures can play in that context. Other exciting conference speakers, also included be Ms. Elaine Watson Editor of FoodNavigator US and Ms. Danielle Nierenberg President of Food Tank. In the interviews by The Marker & Calcalist magazines, Horsky outlined tips to Israeli food & foodtech companies on how to successfully penetrate to international markets. Based on Horsky, Israeli entrepreneurial food ventures should focus on their competitive advantage that usually relates to innovation, food technology and the actual product. Horsky also advocated that when entering international markets, it is critical to focus at the beginning on one test market, ensure successful proof of concept and consumer pull. Based on the learning’s from that launch make any adaptions to the product and marketing plan, and only then consider launching into new geographies. 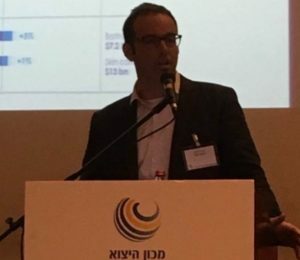 To summarize Horsky believes that Israeli food & foodtech ventures have a strong potential to succeed in international markets in the coming years, and to serve as a growth engine to the Israeli economy.